When I hear the phrase “chicken and rice” I get super disinterested. Something about it just sounds really plain to me and I completely lose interest. HOWEVER – I saw a dish on a menu at a local Thai restaurant with some crazy name I couldn’t pronounce but a description in English that basically sounded like a Thai version of chicken and rice. I was intrigued. 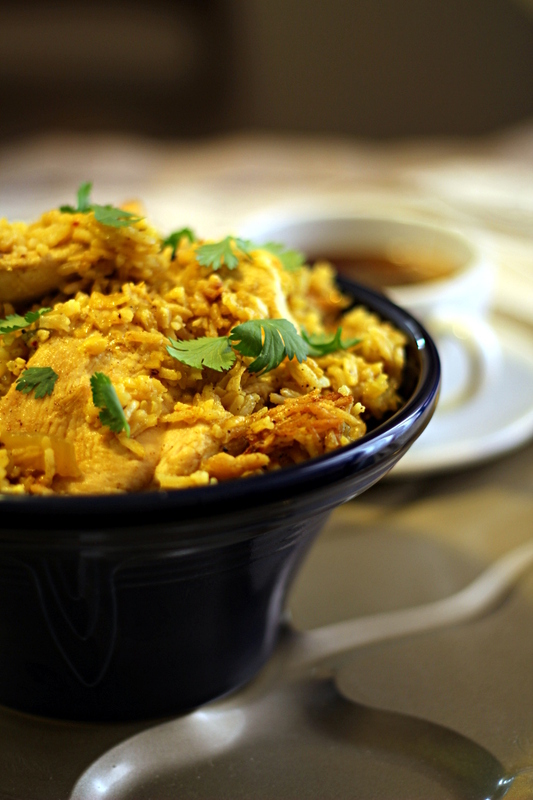 If you DO like chicken and rice, then you will really love this interpretation. 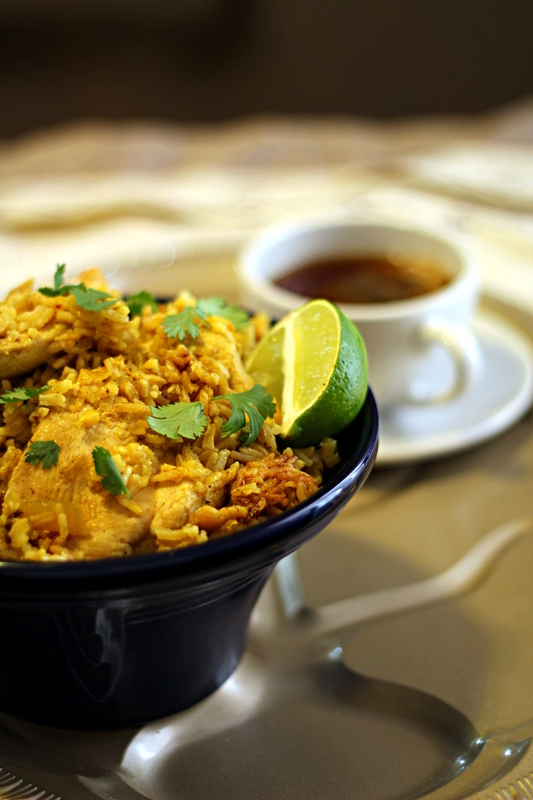 If you DON’T like chicken and rice, you should try this anyway because it may make you a believer. It is such a comforting dish, yet is full of flavor and spices that really make this a unique treat. Ready to start making this deliciousness? Okay, lets go. First, you’ll want to prepare all of your ingredients. Go ahead and chop up the onions, mince the garlic, and slice your chicken breasts in half horizontally to make two thin fillets. Place the chicken pieces in a bowl with a splash of fish sauce and let it hang out for a few minutes. Heat some oil over medium heat in a Dutch oven or other heavy-bottomed pot, then saute garlic, onions, curry powder, salt, and pepper until everything is soft and a vibrant yellow color. Add the chicken pieces in three at a time and spread them out so they cover the bottom of the pot evenly but don’t overlap each other. Let them brown, then flip them to brown the opposite sides. You’re not trying to cook them all the way through, you’re just wanting to get some lovely caramelization on the outside of the meat. Once browned on both sides, remove the chicken from the pot and set aside. Place the remaining three pieces of chicken in the pot and repeat the same process. After you’ve browned all of the chicken and set it aside, add the uncooked rice to the pot and use a wooden spoon to stir it around. The rice will soak up some of the lovely curry powder color and get just a little bit toasted. Add the broth and the heat will de-glaze the pan for you. Use your spoon to scrape up all of the lovely brown bits on the bottom of the pan. Keeping the heat on medium, let the mixture come to a boil. Keep boiling over medium until the water level has dropped to be even with the rice. Some of the rice will be poking through a little bit – it usually takes about 10 minutes. Turn the heat down to medium-low and return the chicken pieces to the pot. Bury them under the rice so they are “hidden” from view. Use your wooden spoon to level off the surface, then cover and go busy yourself with something else for 45 minutes while the dish turns itself into pure magic. I’d recommend having a beer in front of the television. After 45 minutes, the rice should be done and the chicken should be cooked all the way through. Remove the pot from heat and let it stand for another 10 minutes. While you’re waiting, open a second beer and then roughly chop some cilantro and cut a lime into a few wedges. After ten minutes, remove the lid and fluff the rice with a fork. 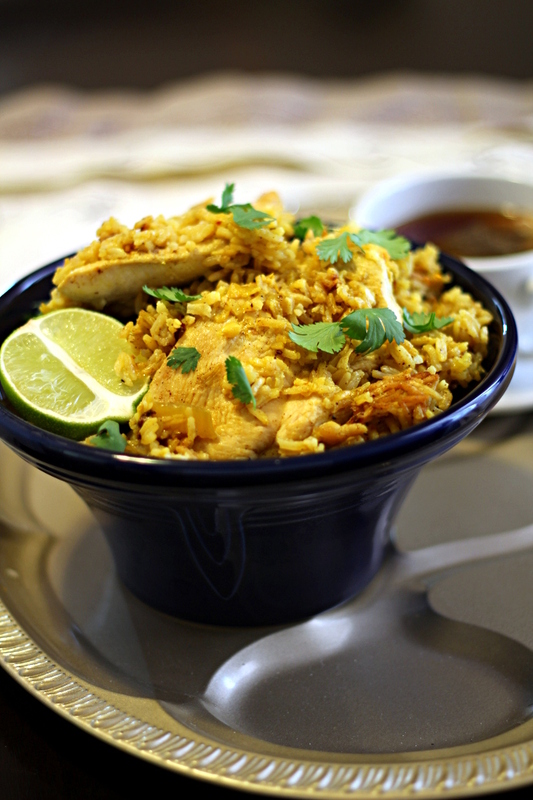 Serve the Hidden Chicken and Rice with lots of fresh cilantro and lime wedges. Place your halved chicken breasts in a medium bowl, add the fish sauce, and toss to combine. Set aside. Heat the grapeseed oil over medium heat in a Dutch oven or heavy-bottomed pot. Add garlic, onion, curry powder, salt, and pepper, then saute 3 minutes or until the onions become translucent. Place three of the chicken breasts halves in the pot and let brown 2-3 minutes, then turn and let the other side brown for another 2-3 minutes. Remove from pan and set aside. Repeat with the remaining three chicken breast halves, removing and setting them aside when browned. Add the rice to the pot and saute for 3-5 minutes until slightly toasted. Add the chicken broth and use a wooden spoon to scrape up the fond (this is the French term for the delicious brown bits on the bottom of the pot – hey, you learn something new every day!). Keep the heat on medium and let the mixture come to a boil. Continue to boil over medium heat until the water level is even with the rice (about 10 minutes). Reduce the heat to medium-low, return the chicken to the pan, bury it in the rice so it is “hidden,” then cover it and let it cook for 45 minutes. After 45 minutes, remove the pot from heat and let it stand for 10 minutes. Fluff the rice with a fork, then serve with plenty of fresh cilantro and lime wedges.